Recruitment in the hotel industry is not an easy thing. The hotel hiring boom is here to stay but serious challenges remain for hiring managers. Turnover is higher in this industry than almost any other. What can employers do to harness current trends and to create long-term possibilities for employees? As a professional involved in the hiring of hotel employees, what should you be aware of? Get the expertise and insight you need to gain a vital competitive advantage. 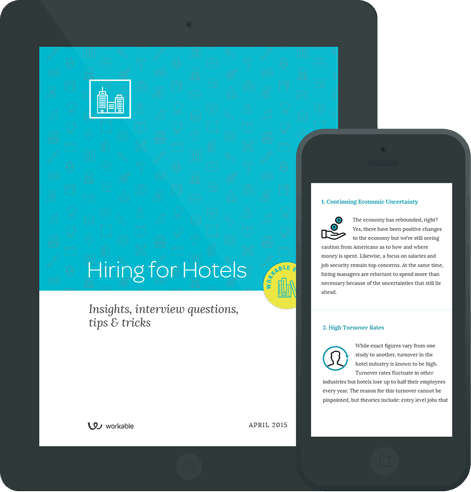 All the analysis, job descriptions, interview questions and letter templates you need in one free eBook about hotel recruiting and hiring. How to ask the right questions See model interview questions that will help you make the right hire. How to navigate the skills gap Learn what you can do to identify missing skills and find people who have them. Secrets of staff retention How to treat your employees the same way you want them to treat your guests. Top templates Discover the best approaches to offer and rejection letters for good candidate experience.